View More In Power-Distribution Kits. 1. High quality RGB LED strip lights, PVC Rubber Material, waterproof, anti-collision, anti-corrosion,Wireless IR control, change the color as you wish. 4.Using for lighting up the entire car interior, plug and play，An easy way to install it in your car, no need to modify the wiring,simply peel off the double-sided tape behind each strip and apply the LED strips under the seats or in the footwell area. 8 Color RGB LED Car Interior Underdash Lighting Kit：Wireless Music Remote Control enables you to change the color and adjust the brightness as you wish, also Sound-activated Function allows you to enjoy the fun with the color changing following your car stereo music rhythm as well as your voice.Just note: no obstacle between the remote and the black receiver box; let the remote close to the receiver box. EASY To INSTALL：Just plug and play.First plugged into cigarette lighter inside the car, then peel the back 3M double-sided tape, paste the light strips on the car floor. You can hide the excess wire underneath the car's foot pad, and it won't get in the way of the car and will not be found.Then press the "on" button on the remote, when the lights light on, you can control the colors with the remote now. Simple design for you to decorate your car a beautiful, exotic and romantic interior. UNIQUE COLORFUL DYNAMIC MODE：There are 4 kinds of gradient modes, 4 dynamic modes.Including rainbow, wave, breath, gradual, flow, twinkle, jump, shift and blasting flash. Choose the mode you like to create an amazing atmosphere for your car interior. 100% SATISFACTION GUARANTEE: Auto Parts Club Car LED Lights comes with a 100% Satisfaction Guarantee. Auto Parts Club commitments, after buying the product if there is any quality problem, the first time to contact us is the most efficient path to solve the problem, we will send new products for you according to the circumstance or refund for you, only to make the best quality service! If you have any questions about this product by Auto Parts Club, contact us by completing and submitting the form below. If you are looking for a specif part number, please include it with your message. 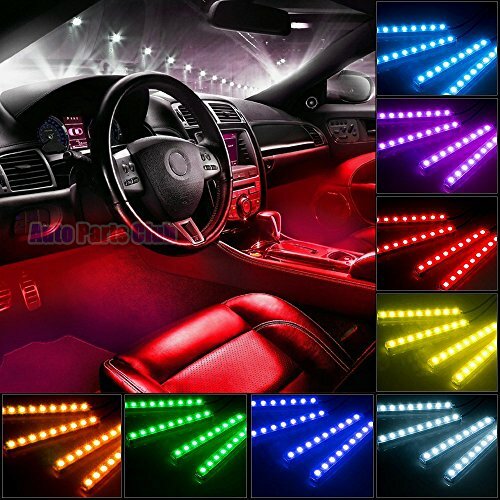 Car LED Strip Light, DLAND Multicolor Music Car Interior Lights with 4pcs 48 LEDS, Music LED Lighting Kit Underdash Lighting Kit with Sound Active Function and Wireless Remote Control.